Home » Sweets & Treats » Cookies » Totally Indulgent Chocolate Cookies … mmmmm! 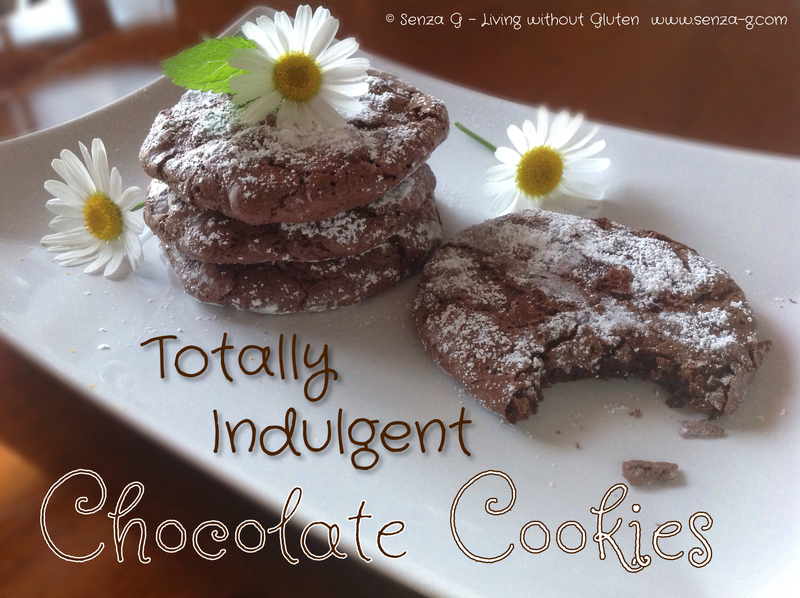 Totally Indulgent Chocolate Cookies … mmmmm! Mmmm …. Chocolate! Who doesn’t like it? These Chocolate Cookies cannot be more chocolatey than this! They are crispy and crinkly on the outside but sooo soft and rich on the inside! I used to love Cadbury’s cookies and used to think that nothing beats them! Obviously I cannot eat them now because of gluten, but seriously once you taste these, you will not go for shop bought cookies any longer, gluten or not! Yes, they are totally indulgent! Preheat oven to 120 Degrees C.
Line two large baking sheets with baking paper. Melt the dark chocolate in a glass bowl in microwave, stirring twice, about 2 minutes. Cool slightly. Using food processor or electric mixer, beat whites in large bowl to soft peaks. Gradually beat in 1 cup icing sugar and continue beating until mixture stiffens. Whisk the other cup icing sugar, cocoa, cornstarch, and salt in medium bowl to blend. On low speed, beat dry ingredients and lukewarm chocolate and the chocolate chips into meringue. With a spoon, place mounds of the mixture, leave a bit of space as they will spread a little and dust with icing sugar. Bake until they puff up slightly and tops start cracking, about 10 to 15 minutes. Cool completely before removing from the baking sheets.